The subtitle of this post should be: How to be tricked into becoming a walking advertisement. Every Saturday, Tess and I like to go to Burrough Market. And, if we're in good shape (we usually are, but some Saturdays we just need to snooze a little while longer), we get there early before the crowds (and sometimes we get there so early, we've beat out some of the vendors). After a lovely Aussie-made cappuccino at Flat Cap, a new addition to the Market crew (and an excellent one at that), we make our way over to Ted's Veg, where we always proceed to buy out the place (okay, well not exactly, but it feels like and endless "and this... and this... and four of those..."). Today, the kind vendor said he was giving out free cloth bags. On the one hand I feel that cloth bags have become the disease of our generation. We've moved from acquiring plastic bags to seeing a multiplication of re-useable bags convinced that it's eco-friendly. Yes sure, to a point. Anyways, I digress. On the other hand, it's hard to say no. So we get these new bags. I mean c'mon, the vendor is all smiley and nice, we couldn't refuse. The bags are beautiful, a rainbow of fruits and vegetables and food in all colours with the motto below: Be Wonderful and Wise. Healthy, inspirational, vibrant and positive. Who couldn't perk up at that? Preaching to the choir, cloth bag, we're already at the market. To be honest, it sort of looks like Tess & I's kitchen (see exhibit A below). The thing is, there's no info. Who made it? What's it for? The vendor won't say. So we go around touting these new digs, going about our usual, etc. etc. When we get home, we find out the truth (the bag told us to search for the motto, so we did!). 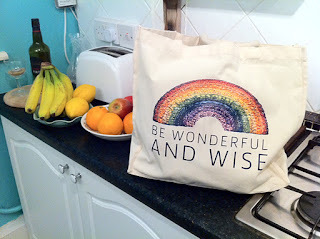 Be Wonderful and Wise is, in fact, the new motto for Lurpak, a brand that is known for their butter. And this new campaign, embracing healthy food in a colourful sunshine paradigm, is meant to launch their newest low-fat spread. The ad, below, (along with all the branding and website stuff) is done by Weiden + Kennedy aka W+K, the ad agency that brought us Nike's Just Do It and Old Spice's The Man You Could Smell Like campaigns. It's super creative and fun and foody. But somehow I feel a little cheated. So, unknowingly, I became an advertisement? Why not just embrace butter in all its glory (a la Julie & Julia)? Or, gasp, in moderation? Why not start touting a healthy olive oil, branch out and actually get healthy? I know, that would go against the 100+ years of history of a company that is KNOWN for butter. It is nice to know that a big corporate company is trying to operate on a human level, spread the love of food, share recipes, think seasonal and connect to the food that goes beyond just its product. Their website is fun and friendly. Explore the rainbow, see what foods are fresh this week and on and on. It taps into people's curiosity about food and connects their product with all the produce they see around them -- just like all that available at Burrough Market. But the last thing I want is to think "Oh look at those beautiful turnips! Hm, I should cook 'em in Lurpak!" It's sort of like Lurpak has co-opted the Skittles Taste the Rainbow, to bring it stealthily and mischievously into the healthy realm of fun colourful produce (while subtly pushing its own corporate goals of sales). Thus, something just doesn't feel right... How's that for wonderful and wise?